...by offering you substantial assistance in the form of special software, designed to make your work easier. Simply download or order now. PACTware is a vendor and field bus neutral software solution for the operation of devices in the field, which is also used by KSB as a standard service tool for automation products. Drivers (or DTMs = Device Type Managers) for field devices from different manufacturers can be loaded into the service tool and are then available for selection in an electronic hardware catalogue. Parameters can be set using a laptop, for example, which is connected to the field device via the RS232 interface or USB (only for PumpDrive 2 / PumpDrive 2 Eco). PACTware requires at least 100 Mbytes of hard disk space and 50 Mbytes of main memory. We recommend using a computer equipped with a Pentium III 400 MHz processor or higher, XGA graphics and a Microsoft-compatible mouse or equivalent pointing device. 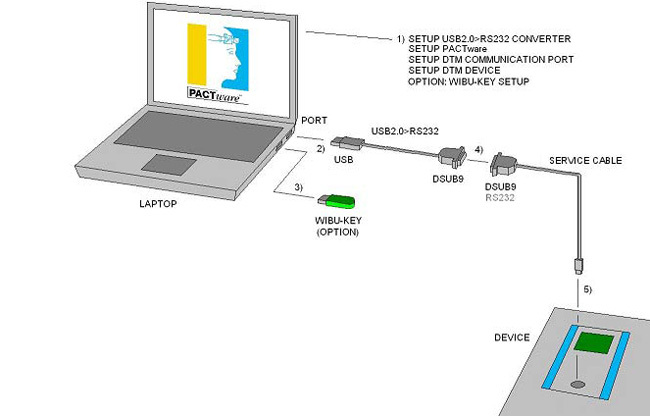 For laptops not equipped with an RS232 interface, a USB to RS 232 converter can be used. When connected to a USB2.0 interface, this converter provides an RS232 connection once the relevant driver has been installed. This converter is not needed for PumpDrive 2 / PumpDrive 2 Eco. The authorisation to allow parameters to be changed at the "Service" access level can be provided with the aid of an optional dongle. To prevent untrained personnel from altering the parameter settings on the devices, KSB uses dongles supplied by Wibu-Key, which are connected to the USB interface. A parameterisation cable (USB – optical) is needed for the connection between laptop and PumpDrive 2 / PumpDrive 2 Eco (0,37kW - 4kW from 31.07.2014). For the activation send an email to support.servicetool@ksb.com.